Mason at home surrounded by his sister, mom and dad. Mason is a kind-hearted 16-year-old with a great sense of humor. He lives with his parents, Nicolle and Jesse, and younger sister in Arizona and is surrounded by a mighty community of aunts, uncles, cousins, grandparents and neighbors. 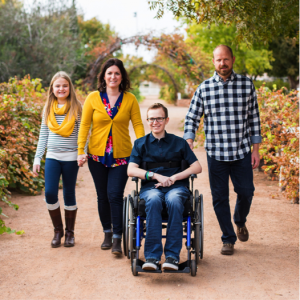 In June of 2015, Mason suffered a stroke that paralyzed him from the chest down. It was later discovered that the stroke was caused by glioblastoma, an aggressive form of brain cancer. 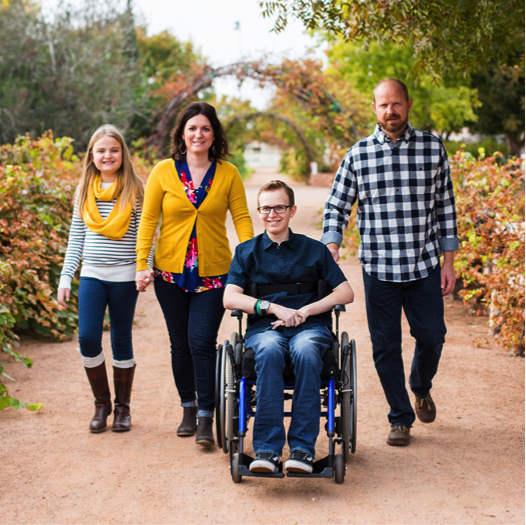 Mason was sent to MD Anderson and began cancer treatment and rehabilitation to help regain motor skills lost during his stroke. As the family was wrapping their heads around Mason’s diagnosis, they were hit with another devastating piece of news. The colon cancer that Nicolle had previously beaten was back for the third time. Mother and son fought side-by-side as their cancers progressed. Together they faced multiple surgeries, in-patient hospital stays and lengthy treatments. With both his son and wife to care for, Jesse had to drastically reduce his usually busy workload as a commercial flooring installer. He purchased a handicap accessible van that allows him to transport Nicolle and Mason, with his wheelchair, to their daily appointments. The significant loss of income and purchase of a second vehicle put financial stress on this family in a way they never could have anticipated. Their large family and community rallied together to support them as best they can, but they continued to sink into an ever-deepening pile of bills. A grant was issued covering the van’s insurance and associated costs as soon as Family Reach learned of the family’s struggles. This assistance provided more than a financial sense of relief – it ensured Mason could safely maintain access to his treatment. Click here to provide life-saving support to families like Mason’s.